BNKB Games is running a Kickstarter for Nightlight, their cooperative card game of nightly fright. They're more than 2x funded, so go check out the stretch goals and extras. Nightlight, a unique card game featuring stuffed animal heroes facing down childhood nightmares, has just launched a campaign on Kickstarter with outstanding response. 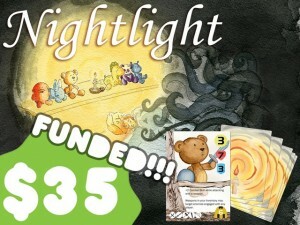 Nightlight, from BNKB Games, will be featured on Kickstarter until September 10, 2014. Each card in the game features water color artwork from local artist, creating an elegant hand-crafted appeal, while the game features easy-to-master game play fit for all ages. Join the fight against the Nightmare! Defend the Nightlight as a stuffed animal hero! As a stuffed animal in a child’s collection of toys, one to four players must defend the nightlight from terrible creatures that are trying to snuff it out. Arm the characters with unique deck of skill cards and the weapons salvaged from the toy chest to fight back the creepy-crawlies and unknown shapes threatening the dream that gave the stuffed animal strength. Survive three rounds, and everyone wins! Defend the Nightlight Today on Kickstarter! Nightlight has a variety of pledges ranging from $5 to $250 and more. Nightlight is the first project of BNKB Games, a group of friends who came together to create fun and exciting games for all ages. Nightlight has raised 100% of the funding goal within the first four days of launching on Kickstarter, and continues to develop interest for the game from around the world. BNKB Games is excited to continue the campaign with further pledges and Stretch Goals.